Canada's National Ballet School provides the opportunity for professional ballet students, dance teachers and musicians to augment their experience, enhance their skills, add to their teaching qualifications or simply stay in shape through a ballet class with colleagues through a number of Professional Development courses held throughout the year. Concentrating on the refinement of skills and the professional development of the dancer after the completion of academic high school, the program provides a supportive, flexible transition from completion of training to full-time professional practice. Learn more about our post-secondary professional ballet studies. 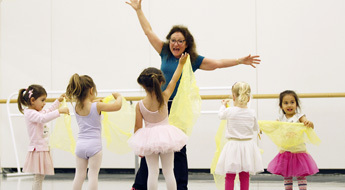 This part-time program offers dance teachers in the Greater Toronto Area the opportunity to add to their teaching qualifications and enhance their skills through courses studied in the Teacher Training Program. Dance teachers are invited to join Mary Ann Lee for a workshop focusing on Creative Movement as a learning tool in the early years. Click for a PDF with information about the workshop. Learn more about the Sharing Dance initiatives by watching this inspirational video! To be a successful dance accompanist requires special skills and qualities. The Musicians' Mentoring Program is a five-day intensive program designed to hone the musician's skills as a dance accompanist in the ballet studio.